Virologist Britt Glaunsinger, an assistant professor in the Department of Plant and Microbial Biology, has won a W.M. Keck Foundation grant for biomedical research, an award given to innovative young scientists. Officials at the Keck Foun-dation, which supports pioneering science, education, and medical research, granted five of the awards in medical research this year. The grant, totaling $1 million over five years, will go to the Berkeley campus to support Glaunsinger’s work using the herpesvirus as a tool to study the inner workings of human cells. Glaunsinger will use the grant money for innovative experiments using the herpesvirus to probe how cells regulate their RNA. The virus uses a mysterious trick to evade the immune response: It destroys all the RNA inside every cell it infects. Glaunsinger’s research group has identified the key viral protein involved in the destruction, but no one yet understands how it works. Glaunsinger thinks the virus is co-opting some of the cell’s normal machinery to regulate RNA stability. Some RNA molecules are long-lived, and some are turned over very quickly, depending on their function. The cell has finely tuned mechanisms to maintain or destroy RNA molecules, Glaunsinger says, but these mechanisms are largely not understood. By learning which pieces of the machinery the virus adopts for its own uses, Glaunsinger hopes to uncover the workings of the cellular machinery itself. Glaunsinger received her Ph.D. in molecular virology and microbiology from Baylor College of Medicine in 2001. 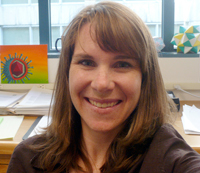 She joined the Berkeley faculty in 2006. In 2007 she received the Burroughs Wellcome Investigators in Patho-genesis of Infectious Disease Award, another prestigious award for young scientists. The Keck Distinguished Young Scholars in Medical Research program was established in 1998. Since then, it has awarded 49 grants to research universities and institutions. UC Berkeley last received one of these grants in 2005, to support the work of Lu Chen, assistant professor of neurobiology.